I WANNA walk on the rainbow!! 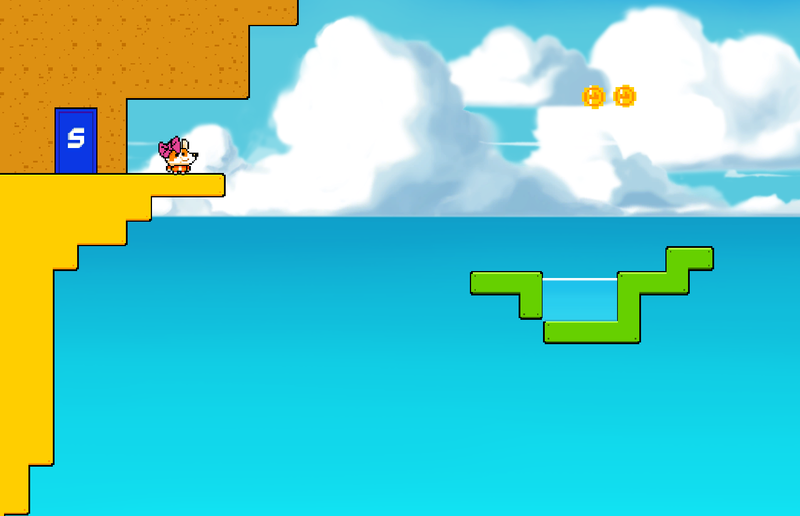 This game is Inspired by line rider,flappy bird and geometry dash,etc.All you have to do is to draw the rainbow and the Character will automatically walk towards the level end. I want to focus on level design and game machinic rather than graphics.So I use the Corgi Engine ... and the assets in it. I hope every level is dynamic and tight and full of imaginations.Only with mouse interactive,I want to see how many kinds of machinics can I design. First we need to build a toturial level.The Level should be simple enough.We just need to draw a simple rainbow to pass the gap. Then we can build a more complex level.Deadly Spikes begin to appear. Now we use tilemap to creat simple terrins and we have basic traps.but this is too normal.we need more strange Mechinics.So I begin to think of what kind of machinics is suitable for my game.I think it should be something full of imagination,wierd,dramatic,simple,and repeatable.Then I try to find what other platformer designer did in their games.I could extend their mechinics and create mine. For example,in VVVVVVVV(I don't remember how much V,but who cares)character often flip around different maps.And I try to creat something like that.Players need to draw the rainbow on the top when characters are flipped,I hope this could make the player confused and lose because of confusion. I hope the players should just use mouse to draw rainbows,so I think there could be some tools to flip character,and I choose the coin.Why do I choose that?There are many reasons.Coins are a very common kind of collections in platformer,but indeed many people don't care about them,because often they are of no use.In cuphead we can use coin to buy things,and the coin becomes interesting in that way. So this gives me the idea that we could add some funtions to the coin and makes a boring thing interesting.And,it's very dramatic that a boring coin would flip you. Currently,the Rainbow looks very strange.it is generated by linerenderer,and there's many problems in it. It doesn't have many extentions and looks static and unnatural.So I generate the rainbow by mesh,and the rainbow could fade after that. Of course we can make more VFX,but we don't have much time. Most of the platformers have limited jump time,cause level design can be very hard if the movement of player is limitless.So I want to limit the rainbowpower.And I made a rainbowpowerbar and the rainbowpower will reduce when drawing.When the power runs out,we can't draw the rainbow. How to refill the power?of course the power will recharge when you don't draw,but that's fun enough.So,When the player is grounded,our refill rate is 3 times faster,and when in air,the refill rate is close to 0.So the ground becomes important to players,and the player often need to touch the ground to refill the power.But it's still not interesting enough.So I began to think about how to reduce the power.if the power only reduces in a locked rate,I think it's not interesting enough.So the reduce rate become more and more slow as the power decreases.So the player will often struggle in the air with the power bar close to 0. Obviously this doesn't look appearing enough.But we will begin to design machinics,which is the interesting part. But first we should decide what kind of game we want.I want to make a game that full of imagination,and I want the game to mainly focus on experience.So I want the game to have a lot of machinics,hope that is not too hard but interesting.Personally I want to make some traps,some easteggs,and some machinics like other games. I think a lot when I was designing this game.But I don't know how to describe it.In fact I want to talk a lot around these.But...currently I decide to just put some pictures here. Still Make Machinics.Actually I think machincs may be enough.maybe it's time to enter the visual part. If I just use the corgi character,it would be very embrassing.So I draw a cute bunny and she will play the leading role.She is on her way to work and playing her games.As a result,she often falls into the holes,....which is very educational.But she has a rainbow earring so she is blessed by the rainbow.So this is why she can walk and play video games at the same time. we do some environment concepts. actually this looks not good.but I can make it better later.I still think the player should walk on a tile-based ground,cause only we can more map through this.But I think we could spend more time drawing the background,cause it's reusable and makes it a better experience to make the game. Actually this character maybe not suitable.I think it maybe a frustrating experience to see the character addicted to a pad and do not response to the player.I 'll consider it later. I think I walk on the wrong way.I don't think this game need heavy art.And the character seems not dumb at all!For such a game,I think use dumb and simple visual is much more easier and interesting. (In fact I try to make a game with cyberpunk visual and indeed it makes no sense. )But I still think I should create my own assets and characters. We create character and redefine our visual style. the character is a monster wearing a helmet and he can't see anything.Why he has a helmet?Well, in Getting over it,we need to use the hammer cause we are stuck in the jar.So...our character is stuck in his helmet. I find it's too hard for me to create complex scenes.And I don't have a thing for color too.So I just draw some geometries which like the mountain in mario. Thanks!The character's behavior is strictly limited in this kind of game and the two pipes in flappy bird is actually a good design.So I made that.